Sign says ‘no gas’ at Harlem gas station | HarlemGal Inc.
On 110th Street and Frederick Douglass Blvd., did anyone notice the BP gas station on the northeast corner already has a sign up that says “no gas?” This particular gas station is always busy so not too surprised by this. It is where most taxi and/or gypsy cabs in the area fuel up. Hope this place is able to get gas soon. 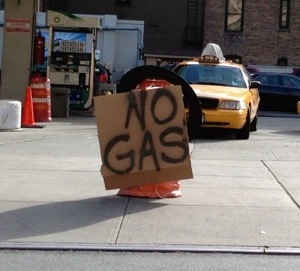 I’ve already experienced a cab telling me they can’t take me somewhere ’cause they have no gas! Has anyone else had this experience recently with a cab? This entry was posted in 110th Street, Central Park North, Harlem and tagged 10026, BP Gas, Cars, gas, gas station, Harlem, Hurricane Sandy, transportation. Bookmark the permalink. Gas stations all ver are out because of the storm and delivery problems. Talk about no gas.. Yesterday I finally landed at la guardia (after 3 days of trying to get here). I shared a taxi with another person traveling to Harlem . The taxi driver warned us he was low on gas. En route to the triboro, it was super backed up so he drove thorough queens to the 59th street to get us to manhattan. 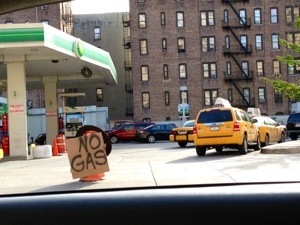 He dropped us at 1st ave /60th street , said he had no more gas, and to pay what we wished. Luckily soon thereafter, another taxi came and took us to Harlem.